Hollywood’s most unlikely mega-franchise returns with the awkwardly titled The Fate of the Furious. Not having skipped a beat since the tragic death of Paul Walker, this eighth instalment in the Fast and Furious series has retooled with a new director and the addition of not one but two Academy Award winning actresses to the cast. No one does what the Fast & Furious franchise does better than them. From reasonably modest beginnings, and seemingly stalled after its third entry, it has become the jewel in Universal’s crown and has taken over US$3 billion worldwide. Very few franchises make it to seven films, and those that do are often on their last legs, but with Furious 7 this one just keeps getting bigger. For all the limitations Vin Diesel may possess as an actor, he definitely has a talent for getting sequels made. In the same year that saw the sixth instalment in the Fast & Furious franchise we also get Riddick, the third in the sci-fi thriller series that started back in 2000 with Pitch Black. After an unpopular detour into the fantasy genre with 2004’s The Chronicles of Riddick, Riddick attempts a return to the simple formula which made Pitch Black a hit. Once again, the Furyan killing machine Richard B. Riddick is fighting for survival on an unknown hostile planet. In the films overly long opening passage, we watch a lone Riddick employing his survival skills in dangerous desert terrain. We see him fight off aggressive aliens, treat his own injuries, and adopt an alien dog as his companion. This dull opening passage is accompanied by awful narration. This narration is absent from the films later passages where things are actually happening, and seems clearly to be the director’s acknowledgement that what we are seeing is not sufficient to maintain our interest. Eventually Riddick stumbles across an abandoned supply station and activates a distress beacon. The signal, identifying the wanted Riddick as its source, draws two groups of respondents. One is a group of bounty hunters after his head, the other is a military squad after information. At this point the film undergoes a change in point of view. Our primary focus now becomes these respondents. After being the central focus of the first section of the film, Riddick becomes an ever present yet unseen menace who torments – and in some cases slightly more than torments – these new arrivals, in his efforts to commandeer one of their ships to escape. It is this passage of the film, where Riddick is the hunter seen only in glimpses, that is most engaging. But time is not on Riddick’s side. A storm is coming and bringing with it a plague of giant scorpion-like aliens. 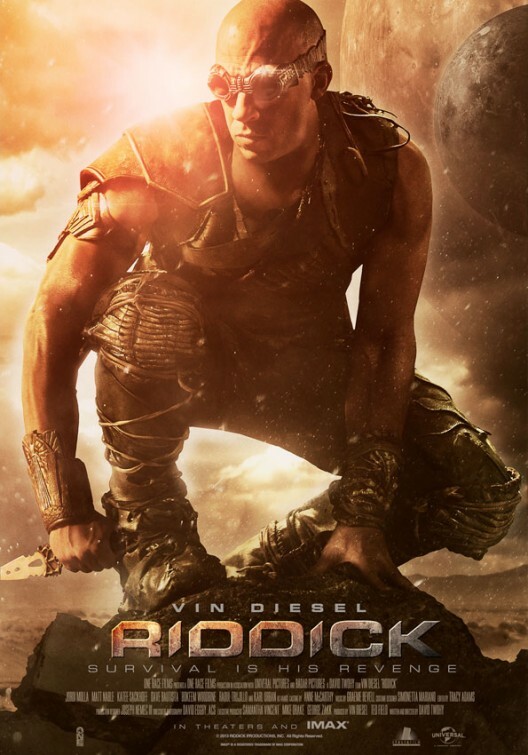 So Riddick and his would-be captors have no choice but to join forces. As the plague of aliens descend on the characters cooped up in the small supply station, Riddick becomes very derivative of Aliens. Note that I specified Aliens, James Cameron’s gun-heavy, subtlety free sequel, rather than Ridley Scott’s suspense fuelled masterpiece Alien. Transitioning from the middle passage in which the danger, Riddick, could be anywhere, to this finale where the danger, aliens, is everywhere takes all of the tension out of the film. Your only reason to engage is if you care about the characters, and unfortunately even this late into the film you have been given no reason to. Riddick is a film almost devoid of any likeable characters. There is no one you can comfortably side with. It is an action movie without a hero. Riddick himself is so violent in both his actions and his manner, and seems to take such joy from that violence, that it would be overly generous to suggest that he even qualifies for the status of an antihero. Even the decision to give him a dog, usually a sure fire way of humanising a character, can only do so much. Not one for those with delicate sensibilities, Riddick is graphically violent and at times is downright offensive, particularly in the way it treats its only female character of substance, the military officer Dahl (played by Battlestar Galactica’s Katee Sackhoff), who despite being one of the most capable soldiers there is constantly subject to sexual baiting from all sides. This seems to be a movie to appease the fans who felt let down nine years ago by The Chronicles of Riddick, but won’t hold much interest for anyone else. Amazingly, as the Fast & Furious franchise extends into its sixth instalment, rather than fizzling out as it tries and squeeze every last dollar out of the concept, it appears to have found a second wind and is getting stronger. 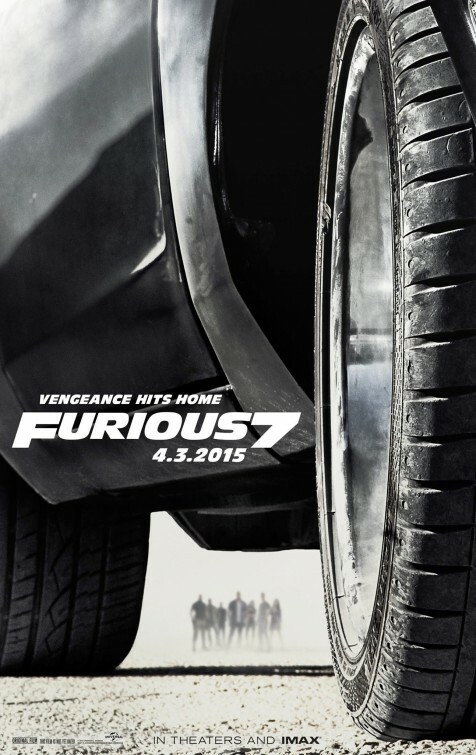 By most every measure of quality, Fast & Furious 6 is terrible, except for one… it is heaps of fun. Adversaries become allies and the hunted become the hunters when Federal Agent Hobbs is forced to turn to Toretto and his team to help catch Owen Shaw, a terrorist he has been tracking across the globe who leads an elite mercenary team of drivers. But what is in it for Toretto and his team? Why would they abandon the high life they are all living having made off with $100m at the end of Fast Five to assist their nemesis? Because one of Shaw’s crew is none other than Toretto’s lost love Letty, who we all thought died in Fast & Furious (the fourth one, not to be confused with The Fast and the Furious, the original). Oh, and she has amnesia… seriously. The strength of this franchise, particularly with this film and the last, is that it knows exactly what it is. This movie is completely ridiculous, but it revels in it. 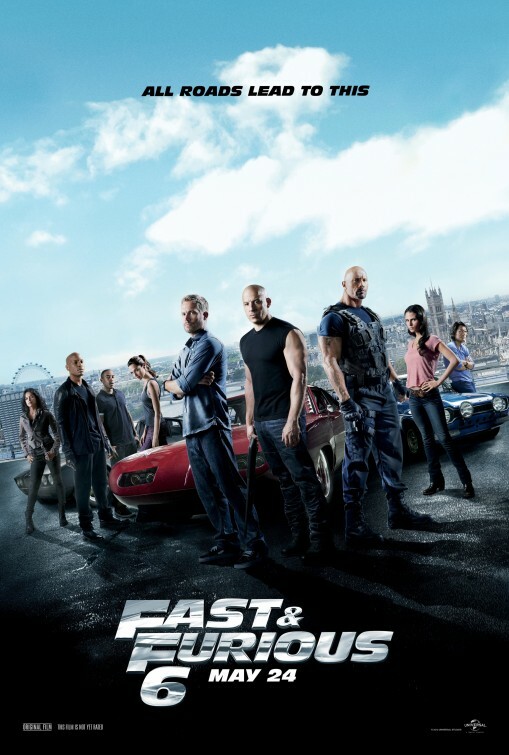 Fast & Furious 6 is director Justin Lin’s fourth film in the series, having come on board for The Fast and the Furious: Tokyo Drift, and he delivers a very self-assured film. He knows what this film is, he knows who its audience is and what they are there to see, and he delivers it. The plot is farcical. The acting is wooden. The dialogue is horrendous. But none of that matters because the there are plenty of laughs (about half of which are intentional) and the action is second-to-none. Lin gives us four major car-chase sequences, each one better than the last and each one good enough to be the climax of most action movies. Of particular note are the chase on a coastal bridge in Spain which features an army tank, and the climactic chase involving a cargo plane on a military base which must have the longest runway in the world. There’s a great little post-credit scene which is going to blow the minds of fans, and assure they are all counting down for number seven.